I decided to blog now, as opposed to after the "break", because I'll forget everything between now and then. This week, we started out by having a video conference with Peg Sullivan, a consultant for library spaces. She talked about user based design within the library. Since their inception, libraries have been focused on creating spaces for the books to find a home. They needed tall shelves, with lots of space to expand, because there was no other way to access information. Now, with computers and the Internet, we can consolidate, so libraries are changing their purpose and their design to reflect this change. What is user centered design, well, it's all about centering the library around the activities that users are going to use it for. Throughout the entire conversation, more than any other concept, I heard her talk about what the library is used for, which means it is no longer a repository of just books. 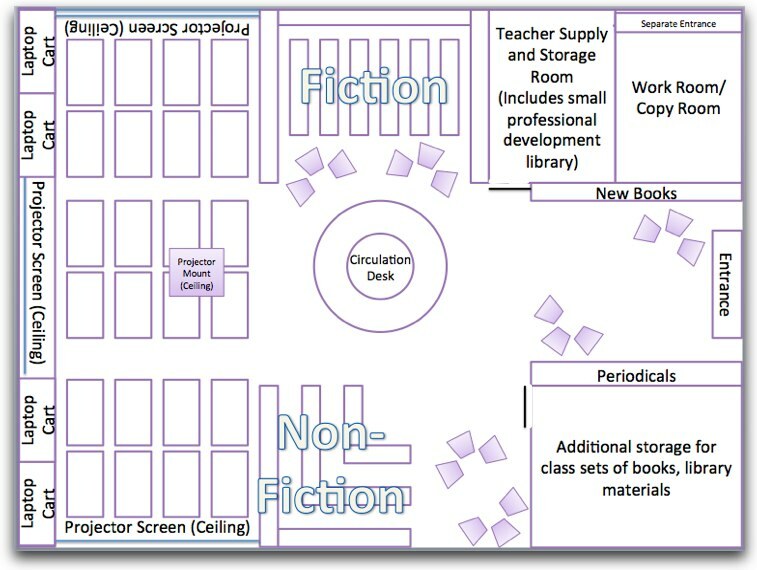 Activities-look at what you want to happen in the library, what are students going to do. Are they going to be on the floor? Are they eating, are they moving things? Interactions--what is happening and what would you like to happen? Objects-what things do you need in your library, technology, seating, tables. What are the physical objects that students are bringing in as well, are they bringing notebooks, laptops, tablets, how do you plan for them using those objects. The other thing that really resonated with me is that it's okay to have a dream list for your library, as long as you don't expect it to happen immediately. Don't cut corners because it doesn't seem feasible right now, if you do one thing on your dream list every year, eventually, you'll have your dream library. After this, we switched gears back to advocacy. It's daunting, we know this, but we do what we can, where we can, when we can, and, if it's not enough for everyone, then we know we did our best. That's about all I have to say about advocacy. This week, no class readings to respond to, enjoy "spring" break! We all hear the story, the school library program is the first to go, or cutting out the librarian for an untrained (and possibly uneducated) assistant. Education cutbacks are always imminent, despite politicians' constantly spouting how children are our future. Perhaps if you are upper/upper middle class and you can afford private schools, the educational system looks like a brighter place. For the majority of Americans, though, the educational system is struggling. Trying to make the ends meet while dealing with vastly increasing class sizes (Michigan law recently changed to allow 35 students per class), and the undercutting of programs, systems, and services. So, what can the librarian, who may be seen as a luxury or unnecessary staff member (or at least the shelvers and shushers might be), do to keep their position relevant? The American Association of School Librarians (AASL), a professional organization affiliated with the American Library Association (ALA), has begun to provide toolkits and aids for librarians to become advocates of their profession and their services. As they state on their website several times, and in several ways, advocacy shouldn't begin when we're in danger of being cut. Advocacy begins when you start your job, meet the principal and staff, talk with parents, create and implement programs, and present yourself as a leader in the school community. But, as Deb Levitov says, "true advocacy is deeper, more meaningful, and more effective than public relations or marketing alone". It's about developing the position of School Librarian as a leader within the learning community, whether it's a personal network at the school you're advocating to, or the state department of education and you're testifying before them. This is probably the most daunting of tasks to me. I'm a natural salesperson (ask anyone who I talked into taking a 20 minute survey for the Utah Department of Health), because I truly believe in what I'm selling. I believe that education, school librarians, and children are worth fighting for, but how do you advocate your programs and services without sounding self-serving? Levitov sees this as bridge to cross as well, she quotes Catherine Byers that "school librarians can't be the lone proponent of [their] school library program. Other voices-parents, coworkers and students-must all play their respective roles in communicating the value of a great school library media center". I think Fontichiaro and Mardis' idea of an elevator speech is a perfect starting point. An elevator speech is "a short, persuasive statement that an entrepreneur makes to a potential investor in the time it takes for an elevator ride (Wikipedia 2008), an elevator speech both informs and persuades the listener to want to learn more in a short period of time (O'Leary 2008)". Basically, it's your pitch for the school library program. Less important than the actual wording is the time and energy you spend deciding why it's important to your community and situation, while tying it in with the common beliefs of AASL. Take what you have been given and integrate it into your belief system. Make it your own. Then, when someone asks, it's an easy answer to give. The next step is to create an action plan, advanced planning for how you are going to advocate. Now, this is where I think people get hung up, because they see creating something else as more work that they really don't have time or energy to do. I see it as aligning your goals and ideals with the goals and ideals of the library. Advocacy in action shouldn't require additional work, it should be a natural part of your systems and processes. So, yes, creating a plan might take more work/time initially, but it should then just be a part of your everyday practice. What is advocacy then? Levitov argues it's the following: A web presence, grant writing, getting on planning committees, showing evidence of student learning, and speaking out to legislators in your area. I think each of those things builds on the one previous to it. Start from the bottom, the basics, then move out to local, then state, and perhaps the nation, but get your own libraries cards in order first. . A blog (such as this one, perhaps), is a good way to show your thinking and document yourself, your processes, celebrate your successes, and reflect on failures. So, where to start, really, the AASL crisis toolkit, if you're already in trouble (and, honestly, there are very few schools that you might start out at that aren't already in trouble), and the AASL health and wellness check to plan and prepare for the future, once you get your feet under you. Advocacy is not an option anymore, we need to justify and support our position, as unpleasant and counterproductive as this sounds. The trade-off, though, is that you are creating the personal and professional networks necessary to sustain the programs in the long-term and instilling in students (the future generation of parents) the need to have a school library. Don't weed in your first year, in fact, don't make any drastic changes in your first year. I think this is true in any job. You can't come into a new place and immediately understand the culture of the environment. If you try to make changes without having the support of those around you, you risk alienating the other employees. So, take a year. Be patient. See how things run, how people interact, and what kind of resources you have access to. By taking the time to build these relationships, you can make changes much easier in the long run. Get involved as much as you can. I was a bit overwhelmed by the amount of involvement of the School Librarian, but by not saying no (to almost anything), she has made herself indispensable to those in need. Again, it's about building those relationships. Once that first year is over, don't be afraid to change things, try new tactics, and make the library your own. Again, this is true in any job, but a bit easier to do when you have your own space to grow into. Take the posters down, move the tables around, wander through your collection (I once heard a school librarian say that she spent at least an hour a week shelving, so she could keep up with the collection and what was circulating), reach out to those who don't naturally come to the library (English classes are always in the library, math classes, maybe not so much), etc. Finally, keep reading and learning about school libraries. When the new principle came and asked about implementing accelerated reader in the school, the school librarian put together recent articles about why programs such as that wouldn't necessarily be the best idea (or achieve the goals they were working towards). She could only do this because she had continued her education. Overall, it can seem pretty overwhelming, what with budget cuts, employee cutbacks, decreased funding, the cyclical cycle of enrollment, and overall fluctuation in the education system. I constantly worry that I won't be able to keep up with everything, but I can only do the best that I can do. Sorry for quoting Vanilla Ice's seminal work, I needed something to console myself for accidentally deleting the draft of my post. It was quite literally a facepalm moment. Anyway, I'm going to try and recreate what I had written, but I highly doubt it will be as good as the one I deleted (as far as you know, it was the best blog post that had ever been written, simultaneously the worst also, thanks Schrodinger!). I'm going to make a bold statement, it might offend some people, I hope you're sitting down: if you, as a school librarian, are not willing to collaborate effectively, then you have no place in the future of education. Wait, I'm going to amend it: if you, as a 21st Century educator, are not willing to collaborate effectively, then you have no place in the future of education. It's as simple as that. All of the readings this week were very explicit: collaboration is essential to the role of educators, especially school librarians, if we cannot collaborate with our educational community, then we are not going to be able to provide our students with the education they deserve or need. Now, what exactly is collaboration? Collaboration is not cooperation. Yes, there is a difference, the first is working together towards a common goal; the second is helping out after the planning process has taken place, it's finding out where you can fit into a lesson that has already been planned. However, collaboration requires cooperation, of course it does, we need to work together, just sooner and more frequently than we expect to or have done in the past. There were two major things that struck me throughout all these articles. First, that working collaboratively is a form of professional development. I had never thought about it like that before. When I think professional development, I picture boring inservice meetings with tepid bottles of water, stale muffins and uncomfortable chairs. If we are working together, researching, questioning, and developing new ideas, we are forced outside of our normal box of thinking, forced to get the background information, make new choices. We are also developing the ever important personal and professional network. The only real roadblock I see, and it is a big one, is the focus on equating teacher pay with student performance, this effectively puts our educators in competition with one another, which does not breed good will and a spirit of collaboration. However, I do see plenty of educators still willing to put themselves out there, sharing their knowledge for the betterment of the group, we just need to foster that. The second major realization I had, was that we, as adults and educators, are subject to the same learning styles as students. Which means, we learn best socially and in context. Which means we are going to go through the same emotions that Kuhlthau outlined in her Information Search Process, this includes apprehension, confusion, and uncertainty. IN fact, I think going through this process will make us better educators, knowing how to muster through the process and come out with new knowledge. It also means that it can be a gamble sometimes, because it's not always going to work. Teachers aren't always going to want to work with us, administrators aren't always going to see our value, but, as all the articles pounded in, we cannot give up! Our role is far too important and the education of future generations is far too important to give up at the first sign of trouble, and what kind of example does that set for students? So, collaborate. Whether it means planning an entire unit with a teacher, including co-teaching and assessment, or it just means teaching the students how to use a tool such as Google Docs. It will take time, energy, failure, confusion, apprehension, small victories, and extra hours, but what worthy cause doesn't require all these things? So, on Friday, we got to meet with some school librarians (media specialists? I prefer the former) from a local school district. They are working on revising their technology plan (which they are required, by law, to do every three years) and wanted our input and to have a discussion about technology plans and schools. For me, the most interesting portion of the discussion was the idea of creating responsible students who are able to navigate this new world of information and social connectedness. Citizen, as discussed, is kind of a hairy word, not really descriptive of what we are envisioning our students becoming. What we want are children who realize they are a part of a global community that is linked by social networks. I think this requires our students to be stewards of their information, as well as to give thought to what they are sharing and who they are sharing it with. It also means we need to teach civility. With new technology and new methods of communicating, we need to decide what is and is not appopriate and treating one another with respect. It's not just about teaching kids the facts, it's about teaching them how to live within this world and be productive members of society, it's just that we're still working out what that means in the long run. I'm going to skip discussion about design, for a minute. There were several pervasive threads that ran through our readings this week, a topic that has become particularly relevant to me (see my last post), is designing effective learning spaces. The school I'll be working at is brand new, but it was not designed by a librarian (or in conjunction with one either). There are two floors of library space, little storage area, and the shelves are placed in the middle of the room, using all the flexible work areas. Oh, and did I mention the room is round? Not ideal, but there are some things that can be changed, according to the readings, to make it a better library for the future. Movable shelving furniture-Libraries should be flexible and usable spaces, what I use it for will probably be entirely different than what another teacher needs it for, or for the group of students who is studying together. To accomodate everyone, things need to be movable, on casters or gliders, able to be moved aside or switched around to accomodate everyone. To this end, shelving should be fixed, but out of the way (around the edge of the room maybe, at least that's my current plan). Space should be open, with tables and chairs that can accomodate at least two classes (or one large staff meeting). I see this kind of space use in places such as the Shapiro undergrad library, or, to a lesser and more annoying extent, in our own class meeting room. Be neutral with your color scheme-There is nothing more useless than painting a wall a bright, trendy color, because the day after you're done, something new will be out and you'll be stuck with lime green walls (I was in middle school, lime green was hot, okay). On the other hand, there's nothing more tacky than sticking with a color for decades, because you have it lying around and it's always worked in the past. The school I went to for my Undergrad had a color scheme that had lasted decades, the color was called coconut dream and it always made me think of the color of the inside of my mouth (light pink, that is). Neither of these things work. Just like with our technology, we need to think ahead when we choose our decor. Which brings me to technology-one to one technology is coming, it has to, because that is how students learn. With lower price points (I can get a Kindle for $79 now! ), ubiquitous internet services (at least in the United States), and increasing support (technical and administrative) we have an infrastructure that we can use technology effectively in, giving our students the tools to succeed in the world at large. Laptop carts instead of computer labs allow the flexible spaces I talked about earlier, with the integration of mobile technologies. Clean up your act-there is no reason a library can't be a friendly, safe, inviting environment and still be highly functional. De-cluttering, cleaning, and redecorating can help students feel more welcome in the long run. I see this where I used to work, there were piles everywhere, it was like a maze of stuff (books, mostly), no one used it because no one knew where to look for what they needed. Simple redecoration is removing superfluous things (i.e., anything that dangles in front of you when you are walking through the library space), cleaning the space, labeling appropriately (sorry, this is a bone of contention for me just in general), and cleaning (dusting, weeding, vacuuming and organizing). Overall, I think it's adorable when they're talking about designing new spaces, because most libraries are forced to work with what they have (and that's sub-par a lot of the time), but these are all ideas that can be implemented, with time and patience, in any library. well hello blog world. No, I didn't disappear. I just got ridiculously busy. Class, internships, writing a chapter for a couple different books (one of which is available here, page 58, the other has yet to be published). I graduate in April, excitedly looking forward to my graduation trip with my parents (we're going to Montreal). On to other exciting and death-defying news though, I got a job, in Bangladesh! Here's my other blog post I wrote about it. Anyway, that's my life right now, I assume I'll update this blog more, especially because my Mom will want me to document my life in Bangladesh. It's funny because I listened to that song earlier tonight...ah High School, a time of indiscriminate taste in music. Where was I? Oh yeah, I was not in class this week, not because I didn't want to go on a field trip, but because I was in Iowa at the UNI Overseas Recruiting Fair. The fair brings administrators from overseas schools and they interview and hire candidates. It was an incredible experience, as an educator and a job seeker. I felt entirely overwhelmed by not being prepared. The packet says I should have resumes, cover letters, and photos of myself. I had them, but not prepared before 1 am the night before. I also had not, as the packet recommended, contacted schools beforehand. I had, however, been contacted by two schools. You see, librarians are in high demand in well-funded private institutions, because they understand the impact a good librarian can have on a school. So, I started my Friday morning at 4:30 am (even though my alarm was set for 5 and I had gone to bed at 1 am), fussing over my clothes and makeup, packing and repacking my purse for the day (the purse that I had bought on impulse at TJ Maxx, spending way more money than I should have), fretting over shoes, etc. I got to the Sullivan Brothers Convention Center (in lovely downtown Waterloo, Iowa) at 7 am, ready for the experience. Checking my "mailbox" I had invited from 2 schools for interviews, one was in Venezuela and the other was in Ecuador, neither was really where I was interested in going (at the risk of sounding snobby, I don't view South American as international, mostly because I could drive there if I wanted to). 8:00-9:30 we were given a pep talk about what to expect, how to succeed, and heard from successful participants. Be open minded to possibilites was their main point, and be careful, because teaching overseas is addictive. 9:30 to 11 am was a lunch break (lunch, ha!). I ended going to a local restaurant and eating by myself, but also chatting with a lovely couple from West Virginia. All the potential candidates were friendly, "Where do you want to go? ", "have you heard from any schools? ", etc. Then came the round robin, where all the schools set up tables in the exhibition hall and you find the schools you should have researched beforehand and sign up for interviews. I had 12 possible schools. China was right out, since they don't give work visas to teachers with less than two years experience. Cyprus had hired a librarian 5 days before. Both schools in India looked at me with dismay and said they needed someone with more experience. I set up interviews with schools in Venezuela, Puerto Rico, Ecuador, Bangladesh and Qatar. Ok, not a lot to choose from, but it was start. Venezuela was up first, we had a nice chat, I had spoken with the Director beforehand, we set up a second interview for the next day. Qatar was next, it was a great school/job, but more than I was ready to bite off; K-12 library that needed a lot of work, not my first year, thanks. Puerto Rico was not really sure if they needed a librarian, but they were interviewing, just in case. Ecuador and Bangladesh were Saturday. Meanwhile, I went back to my hotel and slept for 10 hours. Oh, and before I forget, these interviews I'm going to are all in hotel rooms. The convention center is attached to the Ramada, and the administrators all had rooms. It was creepy, poorly lit hallways and sitting in someones bedroom. 11:30 pm, I was sound asleep, and I got an email from Venezuela saying they were going in another direction. But, wait, I had an interview at 2:30? A quick call confirmed that was cancelled. Oh well, I didn't want to go to Venezuela, right? As I was getting ready to walk out the door, I got an unexpected call from Shanghai, they had a job they'd like to interview me for. I was up front, I knew you needed two years experience for a work visa, but she said they might be able to work it out since I had a Master's, it wouldn't hurt to talk to them. Ecuador was a great school, in the capital of Quito, top of the Andes, really low cost of living, but they paid a little too little, and I had it on good authority they had offered the job to someone else already (only because I kept bumping into her, we were competing for the same librarian jobs). Shanghai indeed wanted me, but, alas, the Master's was not enough for a work visa. They took my resume and are keeping me in mind when I have a couple years under my belt. Which brings me to Bangladesh, where is it, you ask? Well, if I were India, I would put my left arm around Bangladesh. Okay, I thought, it couldn't hurt to go to the interview, what are the chances I'll actually want to do this? This was a new school, new library, they needed good programs, a solid foundation for future growth. Was I up for the challenge? Definitely, but what about salary, housing, travel to and from, internet, and being in a country that people are generally unable to point out on an unlabeled map. The job was mine if I wanted it. Did I want it? After much dithering (i.e. talking at length to anyone I could think of), I decided that, yes, this is where and what I wanted to be: a school librarian in Bangladesh. So, I signed a contract on Saturday night around 7 pm and have felt awesome since. It feels good and right. It makes everything we're talking about in class immediately relevant, because I'm going to need to do it (ooh, maybe I'll write a mission statement!). Most of all, it feels really good to know that I have somewhere to be for the next two years (and possibly longer), that I, a lowly school librarian, is wanted somewhere. Other than what I discussed last week. This was a heavy week, tt's everything we talked about in class, and more. The article Things That Keep Us Up at Night, by Joyce Kasman Valenza and Doug Johnson resonated the most with me, it got me thinking about what really keeps me up at night. Technology, the Internet, smartphones, etc., they have all become ubiquitous and accepted as the standard of education, but we don't think about the economic implications and the haves and have nots. I took a class last semester called Videogames, Learning and Class Design. I loved the basic premise of the class, but I was always annoyed with the idea that we could have 1 to 1 technology for the students. Who is providing this? The truth is, students are bringing their own technology and we ban them from class, rather than utilizing them for their educational benefits. But what about the students who don't have these things? There's no good answer, because it always comes back to money. It will take a public school to set the standard for others to follow. Yes, we need to create "Personal or Professional Learning Networks" electronically, via things like Facebook, LinkedIn, Blogging, and Twitter, but we shouldn't overlook the face to face networks we need to create, especially with local leaders, administrators, unions, teachers, etc. Yes, we should keep up with new practices, but if it's the choice between maintaining a blog and chairing a committee at the school, I think the answer is obvious (sleep two hours less a night, right?). Building these interpersonal face-to-face connections are how we help schools build respect and understanding for our profession. I got this specifically from the articles Moving from Rote to Inquiry, A District's Journey to Inquiry, and How Does a Failing School Stop Failing, making educational progress requires that we try new things, whether they're painful or not. In A District's Journey to Inquiry, they talked about how there was a lot of opposition and dislike of their programs initially, but they also had a lot of good response, and they created bonds that made their jobs easier and the implementation more effective in the long run. Sometimes, you have to bite the bullet and do something new, even if not everyone is on board with it. I know I've said this before (ad nauseum), but I get this from people all the time (friends, family, school colleagues), why would I even want to try? How can you possible help students when you maybe see them for 50 minutes? Why would you want to enter the world of education with all its problems and legislation pushing for assessment? I don't mean to sound flippant, but I think those kinds of questions are bull crap. Seriously. Since when have we become a society of defeatists? "Oh, it loks a bit too hard, why should you even try?" Nothing bothers me more than people who have settled for the bottom rung because they tried to climb once and fell. Would we accept this attitude from our children, heck no! So why do we accept it from ourselves? Overall, I think the entire idea of being a school librarian keeps me up at night, but I think that also means that I have an emotional and passionate commitment and care for my chosen profession; when I stop staying up at nights, maybe that's when I should be worried.